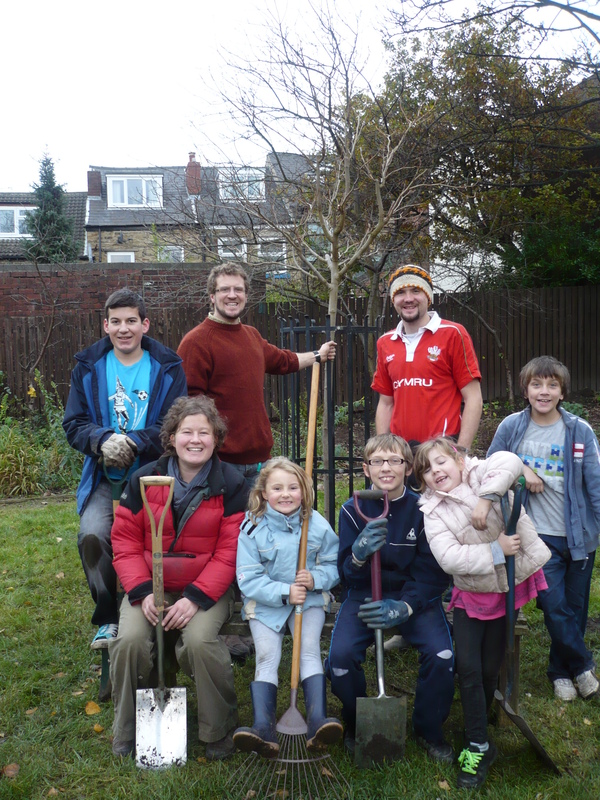 GREAT DAYS WORK AT ALEXANDRA RD COMMUNITY GARDEN | IT'S HAPPENING IN HEELEY! The Alexandra RD Community Garden group held one of our biggest work days yet on Sunday the 14th November, which left the garden looking wonderful. Several new volunteers joined the team and all worked really hard. Overall 12 adults, 4 teenagers , 2 children and 2 toddlers came along to help out. Together we planted 200 bulbs and carried out a general clear up of the site, disposing of the litter and dog-muck left by the less considerate garden users. Working with SCC Community Forester Ed Thatcher we planted 2 trees. A Mongolian Lime, which is a small attractive lime tree, with flowers that can be used to make tea, and a White Mulberry, which is a small tree with sweet raspberry-like fruit. The trees were planted in steel tree guards which have been reclaimed, and now recycled from, Hillsborough Park.